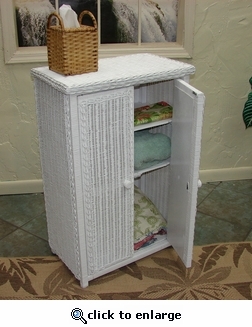 Description: This self ventilating cabinet with three shelves is ideal for your linens, cosmetics, or toiletries. Bottom shelf is adjustable to allow for storage of larger items. Constructed of handwoven natural wicker in White finish.